MINNEAPOLIS & REHOVOT, Israel--(BUSINESS WIRE)--Nov. 13, 2018-- Putting Additive Manufacturing to work across critical rapid prototyping, custom tooling and part production processes, Stratasys (Nasdaq: SSYS) is bringing to market advanced elastomers and enhanced materials for its leading FDM and PolyJet machines. 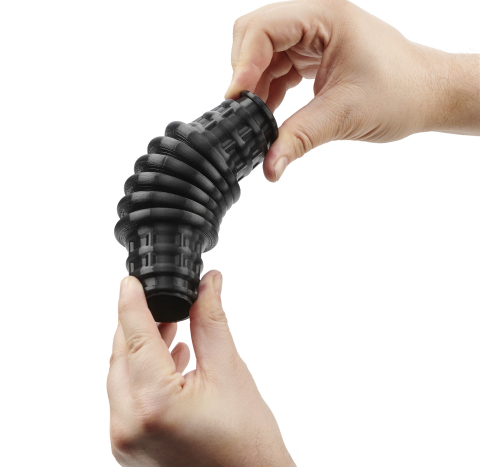 Enabling customers to make it today with 3D Printing, the FDM elastomer solution is intended to provide manufacturers with new levels of elasticity, durability with true soluble support – while advanced colors for PolyJet drive enhanced realism to transform legacy design and prototyping processes. VeroVivid Cyan expands the J750 and J735 gamut to more than half a million distinguishable colors - encompassing rigid to opaque, flexible and transparent. Producing vibrant colors and translucency in a single print, VeroVivid Cyan and the new VeroFlexVivid engineer effective, realistic prototypes for such markets as consumer goods, packaging, and eyewear. Supported by enhanced GrabCAD Print color profiles, designers can actually “print what they see” with enhanced color accuracy. Learn more about Stratasys Elastomer and advanced materials solutions by visiting Stratasyshere. Stratasys is unveiling its elastomer solution and new range of advanced materials at formnext 2018 in Messe Frankfurt, Germany on Tuesday, November 13 – Friday, November 16. The company is offering exclusive hands-on demos, detailed customer use-cases, and presentations throughout the show in Hall 3.1, Stand G40. The statements in this press release relating to Stratasys’ beliefs regarding the benefits consumers will experience from the Stratasys TPU 92A Elastomers and advanced materials are forward-looking statements reflecting management's current expectations and beliefs. These forward-looking statements are based on current information that is, by its nature, subject to rapid and even abrupt change. Due to risks and uncertainties associated with Stratasys' business, actual results could differ materially from those projected or implied by these forward-looking statements. These risks and uncertainties include, but are not limited to: the risk that consumers will not perceive the benefits of the Stratasys TPU 92A Elastomers and advanced materials to be the same as Stratasys does; and other risk factors set forth under the caption “Risk Factors” in Stratasys' most recent Annual Report on Form 20-F, filed with the Securities and Exchange Commission (SEC) on February 28, 2018. Stratasys is under no obligation (and expressly disclaims any obligation) to update or alter its forward-looking statements, whether as a result of new information, future events or otherwise, except as otherwise required by the rules and regulations of the SEC.